Titanic II to have 'safety deck': Australian tycoon - Integration Through Media ....! Sydney (AFP): Australian billionaire Clive Palmer Tuesday said his modern-day version of the Titanic will retain the first, second and third-class divisions of the original and include a new “safety” deck. Releasing the preliminary plans and drawings for the Titanic II, which is to be built in China, mining tycoon Palmer said the massive vessel would have the original nine decks plus an additional safety deck. “This is to ensure the vessel is fully compliant with the current regulations which require passenger ships to, as much as possible and practicable, keep the distance from the lifeboat launching area to the waterline as low as possible,” Palmer said in a statement to AFP. The new safety deck will feature proper lifeboats, safety chutes or slides as well as new common public rooms. Palmer said the upper decks would retain the public rooms, passenger stairs, cabins and other features in similar locations as on the original ship which sank on April 15, 1912 en route to New York after hitting an iceberg. The flamboyant billionaire said Titanic II’s first voyage remained set for late 2016, with the boat due to sail from China to England ahead of her maiden passenger journey to North America. Interest was “overwhelming”, he said. Palmer said the new ship would have a casino, but warned that there would be “strict restrictions” on who was allowed to gamble at it. “There will be some sort of screening to make sure people who do go there can afford to,” Australian Associated Press quoted him as saying. The self-made businessman, who has an estimated wealth of Aus$3.85 billion (US$3.96 billion) according to Australia’s BRW magazine, said the relaunched Titanic would be about one metre wider than the original for “stability”. “But we’ve retained the essence of the Titanic by having first, second and third class. I think that’s very important,” Palmer said. Palmer, who said he would buy a third class ticket for himself, would not comment on the cost of the project but said he wasn’t looking for financial partners to rebuild the ship which went down a century ago. “If you look for partners things mightn’t happen. This is just for me to go for a little sail around the world in,” he said. There was scepticism when Palmer announced his ambitious plans in April to construct Titanic II with exactly the same dimensions as its ill-fated predecessor. 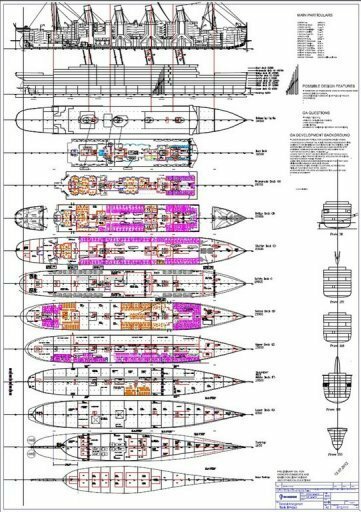 The passenger liner, which will be close to 270 metres long (885 feet), will have an estimated gross tonnage of 65,000 tonnes. The original Titanic, which was built in Belfast, sank on its first voyage from Southampton to New York, killing more than 1,500 passengers and crew.